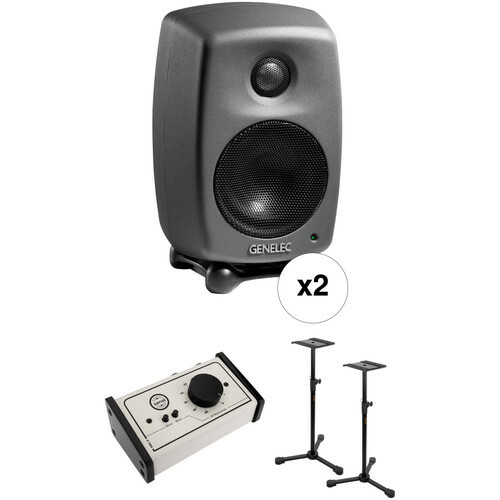 Upgrade your home setup, project studio, or production suite with this B&H Kit, which includes a pair of Genelec 8010 Bi-Amplified Active Monitors, two tripod-base monitor stands, and a passive monitor controller. With a 3" woofer, a 3/4" metal dome tweeter, and two Class-D power amplifiers in an aluminum low-diffraction enclosure, each monitor provides a frequency response of 74 Hz to 20 kHz. Thanks to a small footprint, convenient volume/mute/mono controls, and versatile placement options, this kit is ideal for use in recording, editing, and mixing environments where space is limited. 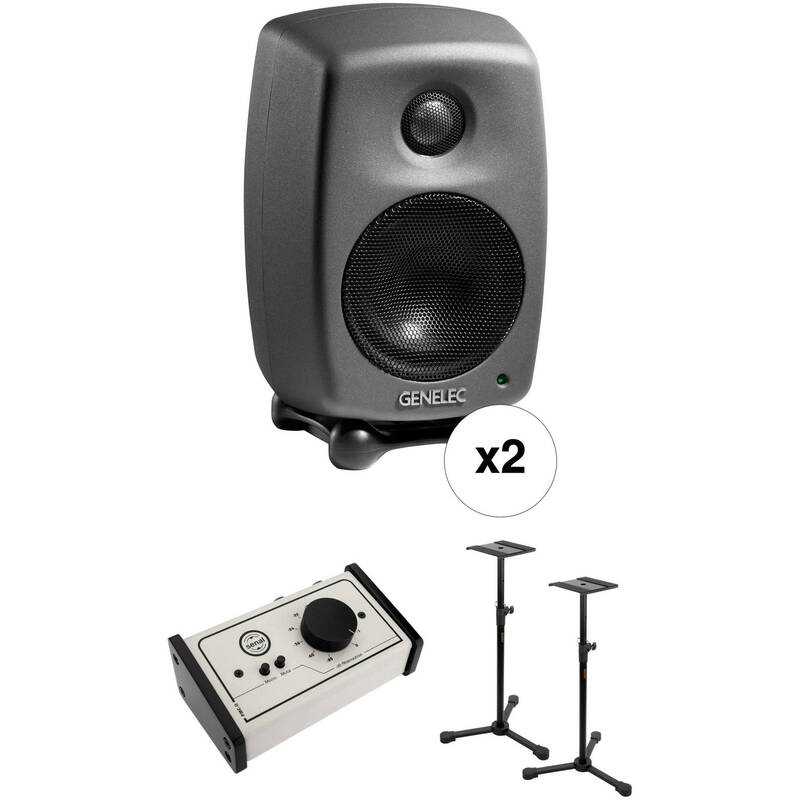 Styled in what the manufacturer has dubbed "Producer Finish," the Genelec 8010 Bi-Amplified Active Monitor (Single) is designed for mixing and mastering in recording studios, broadcast facilities, and mobile work. The compact monitor utilizes independent 25W Class-D amplifiers to power a 3" woofer and a 3/4" metal dome tweeter housed in a die-cast aluminum enclosure. The monitor utilizes Genelec's Directivity Control Waveguide and Minimum Diffraction Enclosure designs to tame box reflections, flatten the frequency response from 74 Hz to 20 kHz, and provide a maximum SPL of 96 dB. The amplifiers utilize Genelec's Intelligent Signal Sensing circuitry to conserve electricity, utilizing less than 0.5W in standby mode, 5W when idle, and 30W peak per amplifier at full output. The amplifier automatically detects the presence of an input signal and adjusts the power consumption of the monitor accordingly. A bass tilt control allows you to adjust the bass response to fit the acoustics of your listening environment. The included ISO stand helps reduce the transmission of structural vibrations into your work surface. The PMC-II Passive Monitor Controller from Senal is for anyone using powered monitors that needs a precise and easy way to control monitor volume. Featuring XLR/TRS combo inputs as well as TRS stereo mini-jack inputs, the controller is compatible with a variety of professional and consumer audio equipment, and it can be used anywhere a separate volume controller is needed. Designed to be inserted between powered monitors and a computer, a sound card, or an audio interface, the PMC-II adds the convenience of accurately adjusting your monitors' volume without having to access the computer or sound card's volume control. In addition, it is equipped with a 1/8" TRS stereo mini-input jack and is compatible with any smartphone, tablet, MP3 player, or device with a stereo mini-jack output. The PMC-II's passive design won't alter or color the sound originating from the computer or device that it is connected to. Built with a steel housing and solid wood panels, the PMC-II is an effective, stylish, and dependable addition to any workstation or studio. The Auray LMS-335 Studio Monitor Stands are durably constructed and designed to support studio monitors at the optimal listening position in professional and home recording studios. Each stand is constructed from steel tubing and a 9" steel plate. An ergonomic locking knob secures the stand, and a locking pin is inserted into six pre-drilled holes to allow the height of each monitor to be adjusted between 35 and 58.5". The three-leg design has a base spread of 23" for stability and a geometry that allows for the stand to fit around corners and beside studio furniture. They come with both interchangeable rubber feet for hard wood floors as well as metal spike feet for carpeted floors. The necessary tools and hardware for assembling the stands and changing the feet from rubber pads to metal spikes are included. Two touch-fastener straps are included on the central supports for neatly securing cables to the stand. Secures stand in six positions between 35 and 58.5"
Box Dimensions (LxWxH) 12.3 x 6.6 x 6.0"
Box Dimensions (LxWxH) 8.0 x 3.8 x 3.2"
Box Dimensions (LxWxH) 35.5 x 10.0 x 9.0"